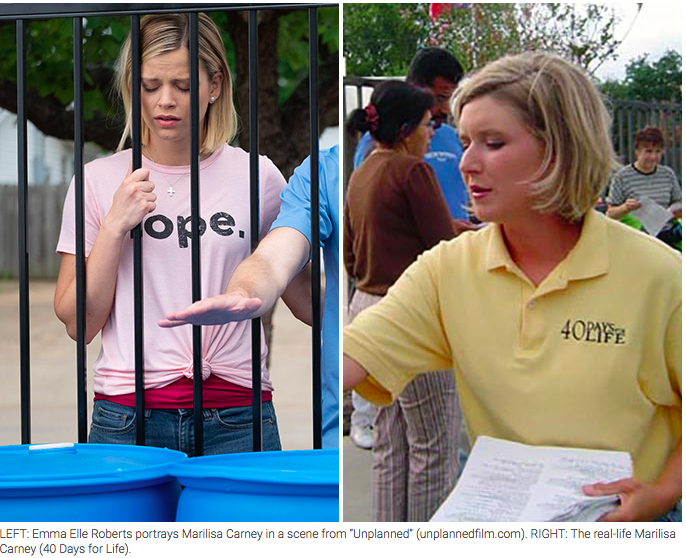 For those who have seen “Unplanned,” Marilisa Carney (played by Emma Elle Roberts) is portrayed as the gentle, persistent and loving soul who befriends Abby Johnson, despite the enormous fence and the even bigger ideology wall separating them. Few people know, however, the deeper story behind the real Marilisa Carney. GRESS: You are a stay at home mother of seven children and wife of Shawn Carney, the president/CEO of 40 Days for Life. How did you got involved in the pro-life movement and what was your role in helping to get 40 Days for Life off the ground? CARNEY: Curiously, my introduction to pro-life work paralleled the way Abby Johnson got involved with Planned Parenthood. It was spring semester 2001, and I was a sophomore at Texas A&M. My church hosted an event featuring different ways to get involved in the parish. I’d never heard of sidewalk counseling, but it really struck a chord with me. I went to the training and then started as a volunteer, first with another volunteer to coach me and then finally on my own. I was at the clinic weekly, but especially on Saturdays when the abortions were performed. Shawn and I began dating that same year and he started to join me at the clinic. The way he tells it, he was instantly hooked. He had always been pro-life, but growing up in a small town, he had never really seen the reality of abortion. But at the clinic, where you watched the women come out, some vomiting in the parking lot, others covering themselves up — hiding in their hoodies out of pain and shame — there was nothing glamorous about this. One of the things we always did was wait until the last woman who had gone in for an abortion left the lot. We didn’t want them to leave without hope and feeling as though no one cared. During that time, there was not one woman who expressed any joy for having “expressed her right.” It was always incredibly sad to watch them leave. All of this made a deep impression upon Shawn. So from 2001-2004, both of us were primarily volunteers. Posted on April 7, 2019 by Carrie Gress.